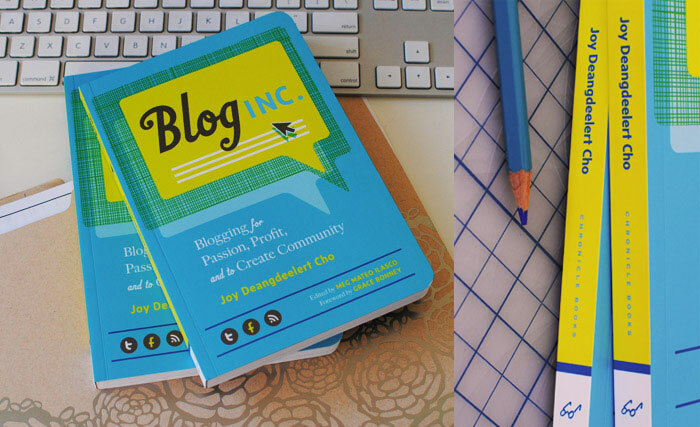 Friends, I have another fun giveaway to do today, this time Joy Deangdeelert Cho's latest book, Blog, Inc. - a book about how to have a successful blog published through Chronicle Books. Times have really changed since we started out blogging (circa 2005), in fact, Joy was one of my first blog friends –and she was also very generous in offering her opinions about the blogging business when we were all first starting out, and so I'm more than happy to promote her book here today and offer a giveaway to one of our readers, courtesy of the folks from Chronicle Books! This is a great little book, for those starting out and even for the seasoned blogger (like me) -I always believe in improving and changing with the ebb and flow of things. So in this season of giving, I would highly recommend it for someone who is thinking of or is on the adventure that is blogging. I remember that first year or so - it was probably the most exciting, it's just a natural progression to want to share your work, your life and in my case my appreciation for design with the world. Back in 2003/4 when I first was considering starting a blog (it took me a year or two to jump in) - I was learning communication design at Emily Carr and thought it would be a good way to catalog work that inspired me. It was just before Etsy opened and finding beautiful design was much harder then. I remember digging deep into the abyss of the scary old internet, running into the beautiful work of (and blogs) of Camilla Engman, Lisa Solomon, Ward-o-matic, hulaseventy, Nebo Peklo, Happy Mundane, Everybody Likes Sandwiches , Bloesem, and of course good old Design Sponge (I remember her green, orange and grey polka dotted blogger template like it was yesterday) Fun fact, I recently ran into a site (the wayback machine) a web archive of sorts where you can look at old site pages and how they looked back then - my blog circa 2006 - check it out - (click on the links too - which will take you back to what i was following - some of them are still there)! I sort of miss those days to be honest, it was such a supportive and rather small knit community; but it's exciting to see where everyone has ventured since, from book deals to established art practices and so on. And I'm so honoured to have Camilla, Lisa, Jeannette and Andrea drop in here every once in a while to do a post. And so without rambling on too much - here's the details on the giveaway! Leave a comment at this post by Wednesday, Dec. 19/12 evening 9pm (Pacific) - and I'll announce a winner Thursday, Dec. 20/12. Anonymous/Unknown comments not eligible. Good luck! Blog, Inc. is available through Chronicle Books and Amazon. I also saw it at West Elm, if time is an issue - you can pick up a copy there. Update! Random Generator picked comment no. 30 for the win! 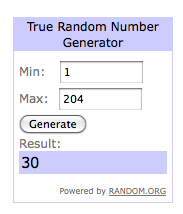 Congratulations to Bree of Dream in Fashion - your comment was #30 ! Please email us with your snail mail details so we can get Joy's book out to you! Yay! Would love to get some advice! Oh I have been blogging for two years now and I would love to get more info on this!Please enter me in the giveaway!AriadnefromGreece! Ooh I've been wanting to check this book out for a while! Thanks for the opportunity to win it! Thank you for hosting such a wonderful giveaway! Looks like a wonderful resource... Please count me in! Oh Joy! I've been wanting to read this book for awhile now. I'm just getting ready to join the world of blogging and would LOVE to read this book! Thanks for the giveaway! I've been a blogger since 2008. This one has been in my wishlist! It would make a great winter read. I've been looking to add this to my New Year reading list. This book is on my wish list this holiday season!! Oh this is such a great giveaway! thanks so much!! I'll take a blog book recommendation from such a lovely site. This would be perfect as I plan to begin blogging for a new private practice in the near (more realistically a couple years off) future. I would love to win a copy of this book... I'm thinking about starting a blog during the holiday or early in the new year, so this would be great ;o) Happy holidays! This book has been on my "to-read" list for some time and I just devour all books having to do with blogging. Thank you for the opportunity to enter! My friend and I have been discussing starting a blog. This book would be an amazing way to get started! Plus, who doesn't love Joy! Unknown - 1:07 PM, December 17, 2012 - eep! please leave your name! Thanks! I absolutly love this blog! I have a blog at http://okiedokieyeah.blogspot.com/ and I would love some tips to make it great! I'm have been blogging for just over a year now but don't really know how to get people to look at my blog, so I think this would be a great book to win!! Would love to read this book and get some tips for my own blog. Thanks for the giveaway opportunity. Wow, as a new started blogger, I'd love to get some tips from the pro's. I'm interested! Any help is welcome, I 'd love to read this book. Would love to get some stellar tips for my blog! this would be great reference/knowledge of info! Exciting giveaway! I would love to win a copy of this book. I have this book on my wishlist. Here is hoping I'll be reading it soon. Great looking book – fab cover design too! Sweet! Your blog is one of that I'm delighted to return to for inspiration. I've gotten as far as signing up for my own blog, but it sits waiting for me to figure out where I want to take it. I would love to read Joy's book and will put it at the top of my wish list I'll go check out the other bloggers you mentioned as well. Please include me in the drawing. Thank you for inspiring, give-aways or not! My sister and I could use this book! Sign us UP! thanks fot this give away, alaways love your blog ! sorry my books in 2013 would be in French, i would love to organize a giveaway on your blog ! I have "creative inc." at home and I am loving it, and I am sure "blog inc." will be equally helpful and inspiring, plus a fabulous design to look at. I have a blog myself since 2008, but there is still so much to learn and to improve. oh this would be really useful! Could use this great book for personal and professional use! Count me in please, fingers crossed! I don't usually register for giveaways but I would love a copy of this book! I'd love a copy of this book. It's been on my Christmas wishlist, actually. Thanks for the chance to win it! Sounds great - I am in! This book was already on my wishlist for christmas! Oh, those were the days... :) I'd love to win this! I always find myself struggling with making my blog more personalized and a more accurate representation of me, this book would be a great help!! Just what I need right now! I've been blogging for several years and am always looking for ways to improve. Thank you for hosting this giveaway. My blog is almost one year old, but I'm sure I still have many things to learn about blogging! Awesome! Thank you for the great giveaway! This book is on my wish list. Would be so fun to win! Great giveaway! Would love to win this book. Love your blog! You can reach me at brookedeal (at) gmail (dot) com. Cheers! Blogging has changed so much, trying to tie everything together, this book looks like a great resource. when I eventually get around to starting my own blog. rennix5 (at) hotmail (dot) com. I'm "online" since 2004, things have definitely changed! I would love to win this book as I am in the midsts of a complete blog overhaul! Hello Jan! I've been wanting to borrow this from Vancouver public libraries but it's so popular that I've been on the wait-list for a while. It would be nice to have my own copy because I'm sure it's a great reference tool that I'll be revisiting from time to time in the future. Thanks for the opportunity! Brilliant! I've read all the other books and they were fantastic. Thank you. I would love to win a copy of this book! A friend told me about I should read it. Looks like a great book to read, I have just started blogging and so this would be a great help. I would love to win a copy. Thanks for the giveaway! I would love to win a copy of this! Thank you ---I'm starting a fledgling blog and would like to turn it into a book! Oh! I really want this book!! I´m IN!! Oh, I'd love to win this book! :) Thanks for the giveaway. This book was on my Christmas list, but just in case! Would be a great read for the rainy christmas break! I would love this book! I was really excited to see this post. As a professional blogger for multiple sites in Cincinnati, I feel like I can always learn more about building a community and coming up with new yet informing topics that can be used for multiple audiences. I'd LOVE this book! 2013 is my year to start my blog! if this giveaway is open to Europe, then count me in! I don't leave comment most of the time, so i'll use this one to tell you that i LOVE your site. You are such a joyful moment on the internet for the eyes and for the spirit! book looks wonderful; would love to win a copy! I could say I'm an intensive blogger (I've like... 8) and that book woould help me a lot! This is just what I needed! Thanks so much Jan for sharing! I will for sure look at your old blog design... I am so intrigued! It adorable looking and I would love it! i would absolutely love to read this book! Thanks for such an amazing giveaway! This book looks fantastic! I would love to win this awesome book. Such a great giveaway! I would love the opportunity to win! love your work and love her work! definitely would love a free copy of this book!! Sounds like a great book for those on the fence about blogging. Like me. :) thanks for the opportunity. I would love to get my hands on this books and try and apply what I learn. I love Joy's blog -- would love to have some of her advice as I start to build mine! I've been coveting this little gem for awhile. It'd make for a good snowy december read! This is on my list of books to acquire! Been meaning to pick this up for a while! My poor sad neglected blog and I desperately need this. Please let us win so I can provide the mouth to mouth Silly Gilly desperately needs! Help needed on that field for sure. Thanks for hosting this great giveaway! What a fantastic giveaway; I've been wishing for this book! Would love to win this book! Good luck everyone. The wayback machine is so fun! Thanks for bringing it to our attention. Count me in for the book contest. Ooh, I would love this book! I've been wanting to read this book when I saw it being recommended by one of my favorite bloggers. Thank you so much for the winning chance! I would love to win this. A Christmas present to me! I'd love to win a copy of this! Sounds interesting and so timely! Thanks! I'm in dire need of this. I'm too scared to blog! I would love a copy too! Thanks! Phwoar, I'd love to have that book! It's just what I need these days. Please count me in! Would love to get win this book! I've only been blogging since August, and there's always soooo much to learn! Would love to win and learn more about blogging! Thanks for the giveaway! Would love to own this awesome book! i started to blog in 2004 but have never really turned it into the kind of thing i envisioned. i would love to have this book! Would be so interested in the good advice and tips in the book! I've been eyeing this book for quite some time now. Would love to add it to my collection! I have heard great things. Thanks for the chance to win. I have read around the internet that Blog Inc. is a good book. I, myself, am looking to read it and work on my blogging skills. I am definitely in for this giveaway. Good book, sounds like a coll tool to improve my blogging. Here is just the book i have been seeking. I have been so intimidated about starting a blog. Even the books available look daunting. Oh what blog posts i could make, that many may see, if i only had a brain.........uuummmm book! I could certainly use the help! Looks like a super interesting book...! My blog is in serious need of an update and this book looks like just what I need to do it. Thanks for the giveaway! I've been blogging casually for nearly two years, but a few months ago I decided to go all in! I hope to make a go of it, and some sound advice would be most welcome. What a Great Book for a Great Giveaway. Hope I get a chance to read it *crosses fingers*. Would love to win this book! As for Design Sponge's old template, I remember it too! Would love to have this. Looks like I can get some useful advice. Thanks for offering the giveaway! Thanks for the opportunity!! I need it for taking my blog adventure to the next level!!! I have this book on my wish list. I'd love to have a chance of winning it. I'm a blogging fanatic - There's nothing like hunkering down over the glow of my laptop and reading countless blogs! I'd love to win the book! I would LOVE to win this book! Fingers crossed! I just began blogging recently and would love the book. It's on my wish list. Thanks from a newbie! I am really interested in reading this - love her! This book looks awesome! Can't wait to read it! I would love to read this - I've enjoyed all the other "Inc" books. I would love to read this book - I've really enjoyed the other "Inc" books. All awesome! such a wonderful giveaway! thank you, Jan & warmest wishes for a wonderful holiday season. What a great giveaway! I would love to win Joy's book to improve my blogging in 2013! Happy Holidays! thank you for this opportunities. I'm really interested in starting a blog but I'm not sure where to begin. I think this book would be a great place to start. This has been on my to-read list! Thanks for hosting this giveaway!